Knowing something about typography is a must for graphic designers. If you really are into typography, you might have a broader idea of how this concept of arranging type really started. If you don’t want to read through the many pages of books or online archives about the history of typography, the recent work of graphic design student Ben Barrett-Forrest might just be what you are looking for. Dissatisfied with other typography tutorials out there, Ben Barrett-Forrest created his own take on the history of typography through a stop-motion animation, telling the beginning of type tracing back from Johannes Gutenburg, the grandfather of printed type until the creation of modern typefaces today. Aside from the mouthful of information you get in five minutes, Ben’s awesome animation of cut-out letters makes it not just your ordinary video tutorial. YTD: Hi Ben! Give us a little background about your work as a graphic designer. BEN: I was born and raised in Whitehorse, Yukon Territory, a small town in northern Canada. I started drawing my own typefaces when I was a very young boy, and more recently got into the fields of graphic design and animation. I am 21 years old and currently attending McMaster University in Hamilton, Ontario, in southern Canada. I am in the third year of my Multimedia degree. I am currently working at a Design and Marketing firm in Whitehorse called Aasman Brand Communications. YTD: Your recent animation short project called “The History of Typography” was pretty awesome! Tell us what made you decide to create such informative production. BEN: About a year ago I fell in love with typography and became a complete type nerd. While there are many excellent resources online to satisfy one’s cravings for information on typography, there was nothing that was as entertaining and comprehensive as I would have liked. I decided to fill this void and create one myself. BEN: First, I did several weeks worth of research to find all the proper information for the piece. Then I wrote the initial script, which ended up being way too long to fit into 5 minutes. So I revised the script down to about 350 words. Then I cut out all of the necessary letters, set up my animation studio in my bedroom, and got animating. 140 hours later, I was done, and ready to start on post-production. The whole process took a bit over 2 months. BEN: My tools are quite simple. I have black, white, and red paper and a scalpel for cutting out the letters. Then I had my Nikon d5100 mounted on a tripod with two 500-watt lightbulbs shining on my workspace. I recorded the sounds using a zoom h4n, and then compiled the photographs in Final Cut Pro X.
BEN: My guiding principles are: Simplicity and creativity. It is a potentially very complicated topic that I was addressing in the animation, so I strove to make it as simple and creative as possible. I knew that in order to capture people’s attention, it would need to be in a visually appealing style, with condensed, relevant information. YTD: What is the most challenging part of it? BEN: The most challenging part of the process was actually the cutting out of all those tiny letters. I was cutting for about 80 hours in total, and my hand got very tired. It was also difficult to make the motion of the letters look real, when they are actually moving in tiny increments. YTD: The animation video is around 5 minutes. We are curious about how long was the actual video production. 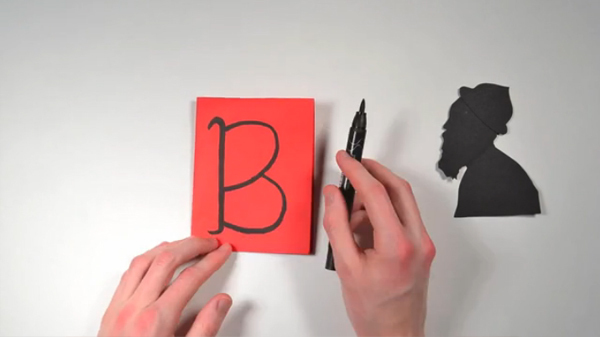 BEN: The actual cutting out and animating of the letters took about 140 hours, over a period of 2 months. The research and post-production took several dozen more. It was fairly tedious cutting out almost 300 paper letters (especially the serif typefaces with their tiny spikes), but it soon became almost meditative. And I feel that I have a much closer connection with each of the typefaces that I addressed, now that I have laboured to create each one. YTD: The project was well received by the design community especially type lovers. Anyone you would like to be thankful for? BEN: I am very thankful to Ellen Lupton and Simon Garfield, who wrote the books that I got most of my information from. I would also like to thank my friends and housemates, who put up with my craziness for several months, and my parents, who gave me so much support.